Residing at House 100 in Edgeworthstown. Killed in action at Hooge, Belgium. New Irish Farm Cemetery, Ieper, Belgium. Richard was born 25 January 1891 in Edgeworthstown, Co.Longford. Pte Dempsey enlisted in Mullingar Co. Westmeath. He was killed in action at Hooge; his mother was informed by his field chaplain Father Molloy and the letter was reprinted in Longford Longford leader of the 14 August 1915, who noted Dempsey's bravery in retrieving casualties from the trenches and the praise their field doctor had for him. He died at the age of 25. 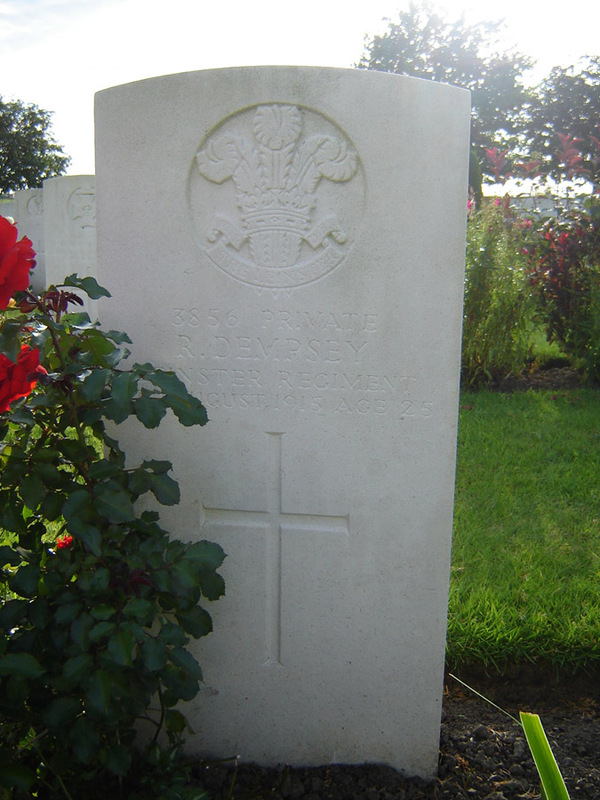 Richard had two brothers in the Great War, one was Pte John Dempsey who also died in 1915, and William Dempsey. Son of James and Kate (née Balusty), Dempsey of 5 Church St. Edgeworthstown.